ConceptDraw DIAGRAM is a software for drawing flowcharts. Accounting Flowcharts Solution gives the ability to easily draw flowcharts that accurately represent accounting process that need to be described in an organization. There is a library, samples and template in the Accounting Flowcharts Solution that makes visual presenting of such processes like a receiving process, purchasing process, payment process simply to create. You can start with any sample and change it for your needs or just draw new Accounting document using the pre-designed vector stencils from the library. Accounting Flowcharts solution from ConceptDraw Solution Park provides templates, samples and library of vector shapes for drawing the Accounting Process Flowcharts. Create business process diagrams (BPMN 2.0.) with ConceptDraw using professional looking templates. ConceptDraw is business process improvement tools. Purchase Process Flow Chart,Receiving Process Flow Chart,Accounting Flowchart Example. The purchasing process follows very specific guidelines and includes a purchasing cycle flowchart and receiving process flow chart. Common key elements of purchasing process. It is important to know how purchasing processes work and how each operation is done. 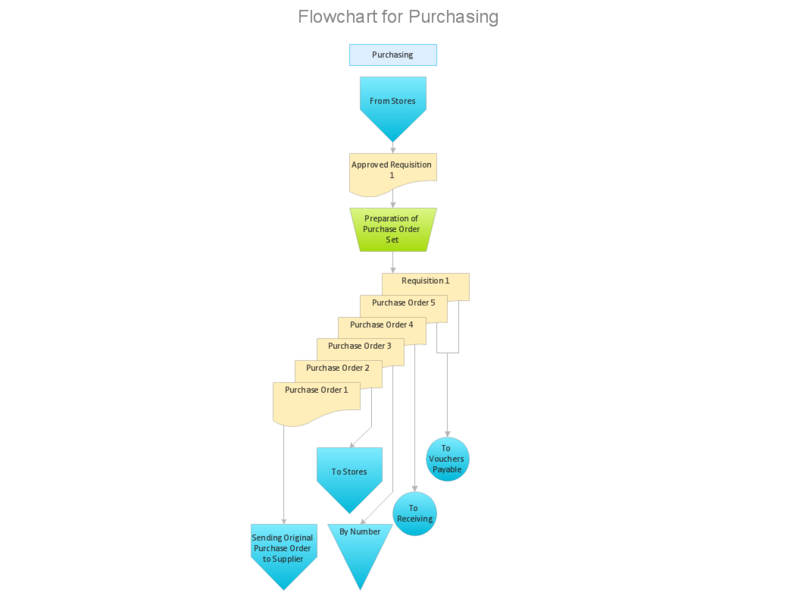 Picture: Purchase Process Flow Chart,Receiving Process Flow Chart,Accounting Flowchart Example.